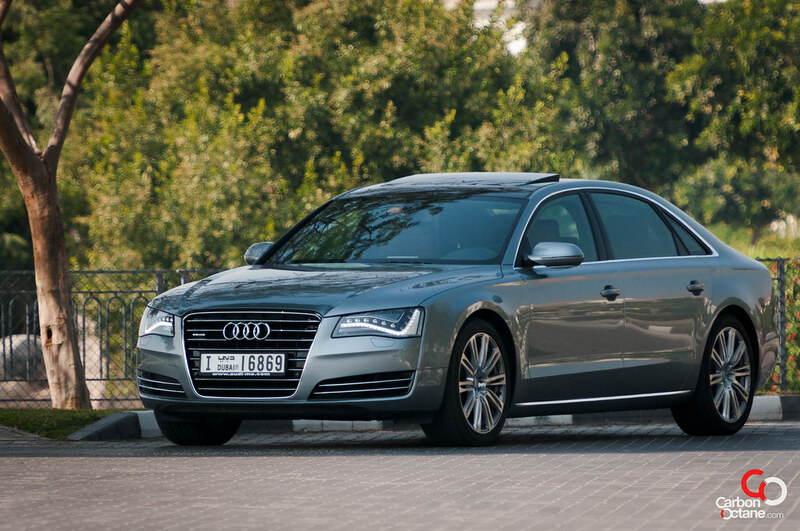 It is fair to say that expectations were running high when the Audi A8 got enrolled in the test roster. This was after all the latest salvo from the Ingolstadt based manufacturer in what has become a three pony race for the Best Teutonic Executive super Saloon. Considering that BMW had just upstaged the Mercedes S Class recently with a revised 7 Series, Audi’s response with an all new A8 was expected to close out the argument – for the time being, at least. 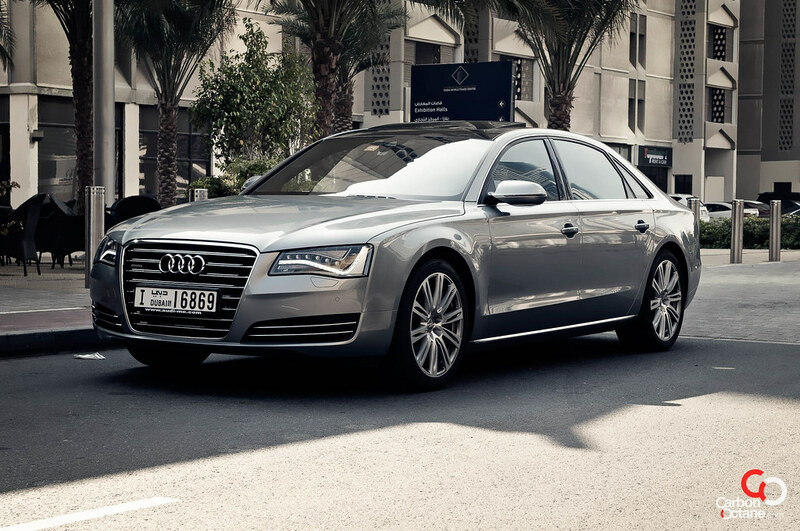 Until recent times, the Audi A8 range was considered a remote third behind BMW and the Mercedes in aspirational value. 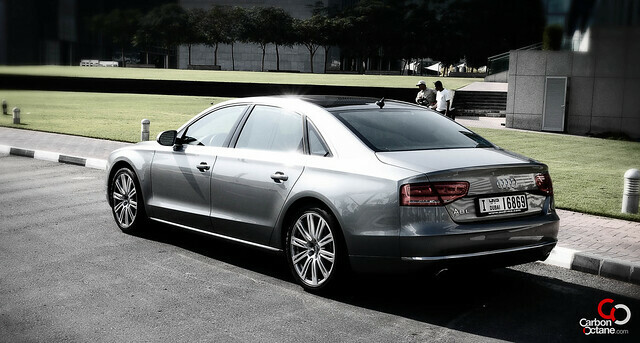 That changed when Audi introduced the S8 with its Lamborghini Gallardo based 5.2 V10 with a monstrous 540Nm of torque. It helped when a certain ‘Transporter’ by the name of Jason Statham got behind the wheel of a black S8 and thrashed baddies while playing chauffeur, all the while looking suave and unruffled. Suddenly, demand for Audi A8s and especially S8s (in black, thank you) shot up and surprisingly for a luxury car, many were snapped up by young guns who reveled in the ‘Transporter’ association. Audi’s design update loses the previous generation’s low slung, broad shouldered look that Hollywood and Jason Statham (there’s that name again) used to good effect in projecting a mean image. The new shape incorporates a higher roofline that, to our eyes at least, make it look more a gentleman’s express than a comfortable bruiser. The shapely headlights, now fitted with an all-LED bulb arrangement as an optional extra, go further in softening the tough car image. Do we miss the old A8’s profile? Frankly, we do! It remains a timeless design that has not aged, and is surely in line to be a future classic. Our test car was the A8 3.0L. In this market, a 3.0 litre V6 engine might sound underwhelming especially when you see the size of the machine it has to propel. However this unit has been beefed up with a turbo charger that scoots the A8L from a standing start to 100 kms in 6.2 seconds before going on to hit an electronically limited top speed of 250 kmph. 290 horses help achieve this shove, aided fully by 420 Nm of torque available in a seamless curve from 2,500-4,850 rpm. Supporting all this power and channeling it to the road is ASF (Audi Space Frame) which uses lightweight aluminum through out to reduce weight and impart a sport feel. 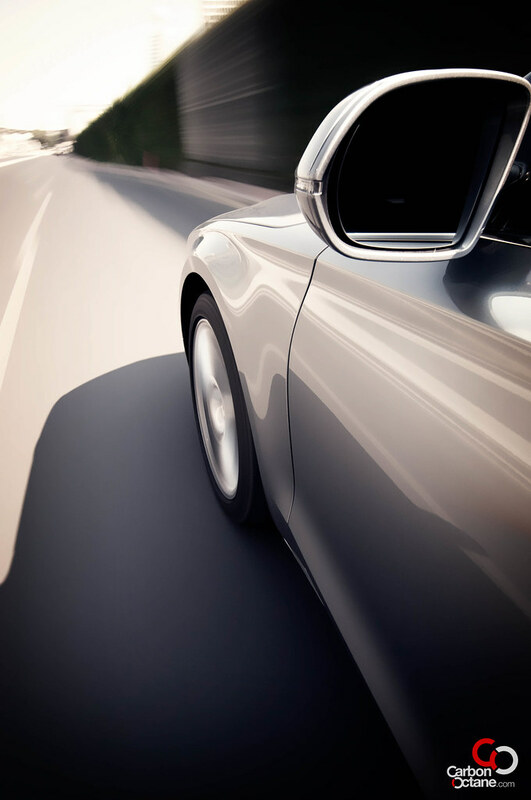 As you would expect, overtaking slow traffic requires just a brief pressure on the accelerator pedal and the pass is done quickly and with minimal fuss. The claimed fuel economy of 9.3L/100 km is therefore an added bonus when you have such lively performance, but it’s not surprising seeing how the drive is stretched out over 8 gears. Equipped with classy 20”, 10 spoke alloys, the road grip was always excellent in the A8L. An Adaptive air suspension allows fine tuning the drive to your preference through Audi Drive Select which lets you choose between Comfort/Dynamic / Auto and Individual modes. The Individual mode offers a range of mix-and-match options for suspension/steering feel/engine response etc. that can be used to alter the feel of the car and get a tailor made driving experience. To cap everything, the control dial is so intuitively designed that even a Luddite would be singing praises of the ease in navigating the menu. The icing though is lavished in the interiors. Only a few kms into the first drive in the A8L, it dawns that this car is as much about passenger indulgence as it is about the driving experience. 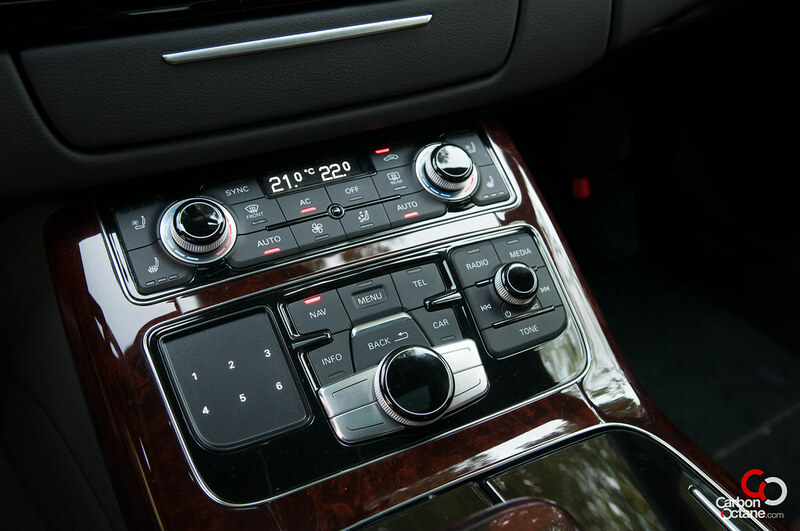 The A8L is a high spec luxury cruiser, with that last alphabet on the designation fully responsible for adding a precious 5 inches to an already long wheel base. That increase is purely in the passenger area and contributes to a limousine like rear leg room. However we doubt any limousine exists that’s been done up with as much taste as the A8. 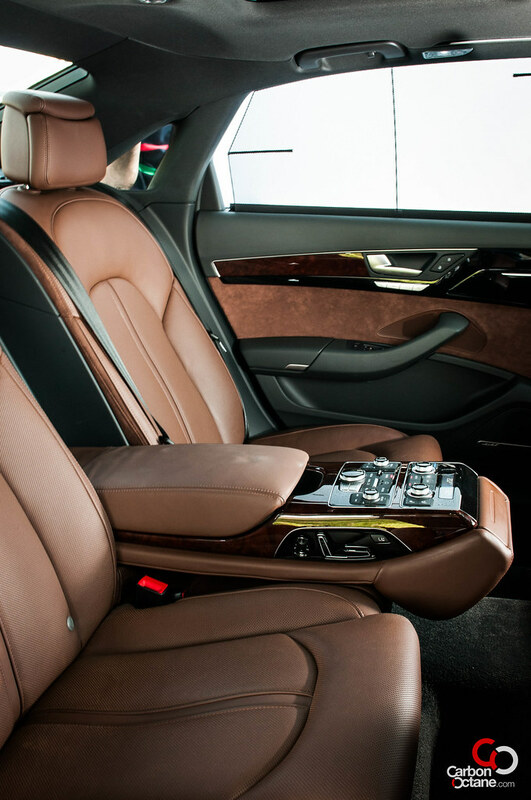 The luxury feel is further enhanced by sumptuous leather seats that cosset the passenger in a zen-like environment. Our tester came with nougat brown Valcona leather interior with Walnut brown inlays and looked tastier than Ferrero Rocher’s most tantalizing. 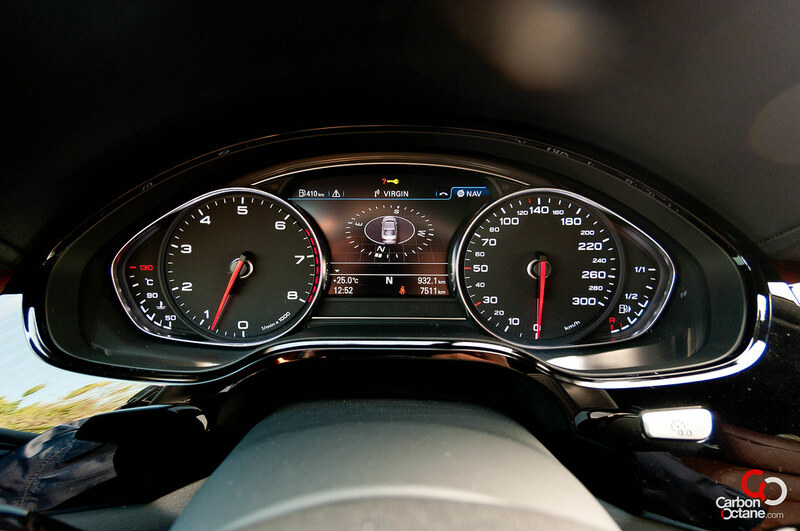 None of the other German manufacturers design dashboards with such a lovely blend of simplicity and style. The instrument layout, the materials used, the feel of the switches all contribute to convey top quality. Every switch is within reach, every dial placed for easy viewing. 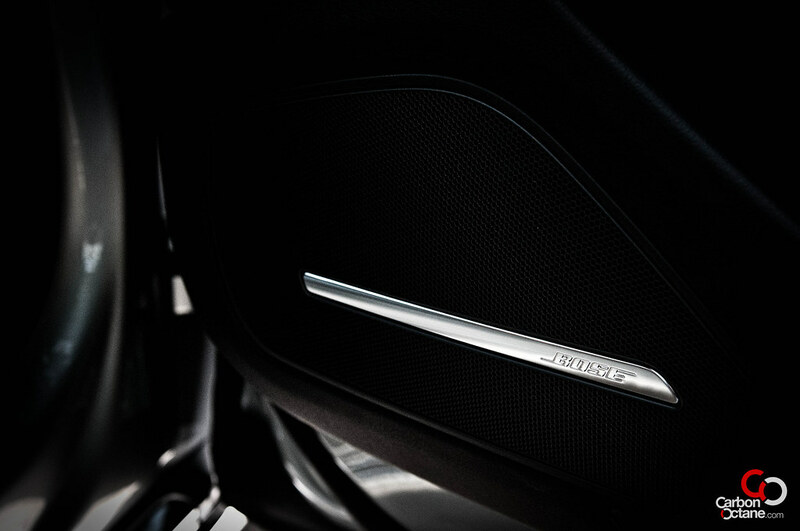 The pop-up display screen tucks away neatly when not required, leaving a clean swoop to the dashboard. 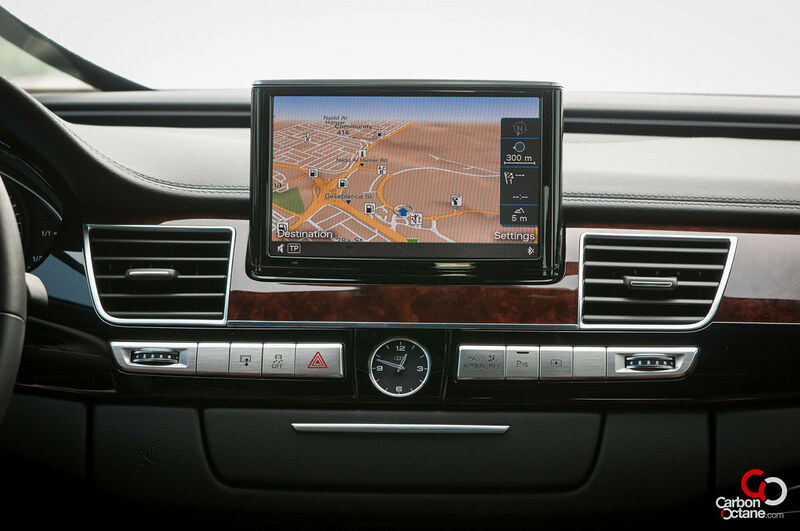 Driver information is available with minimal navigation and despite the amount of information available; the instrument console is simple, basic without being austere. 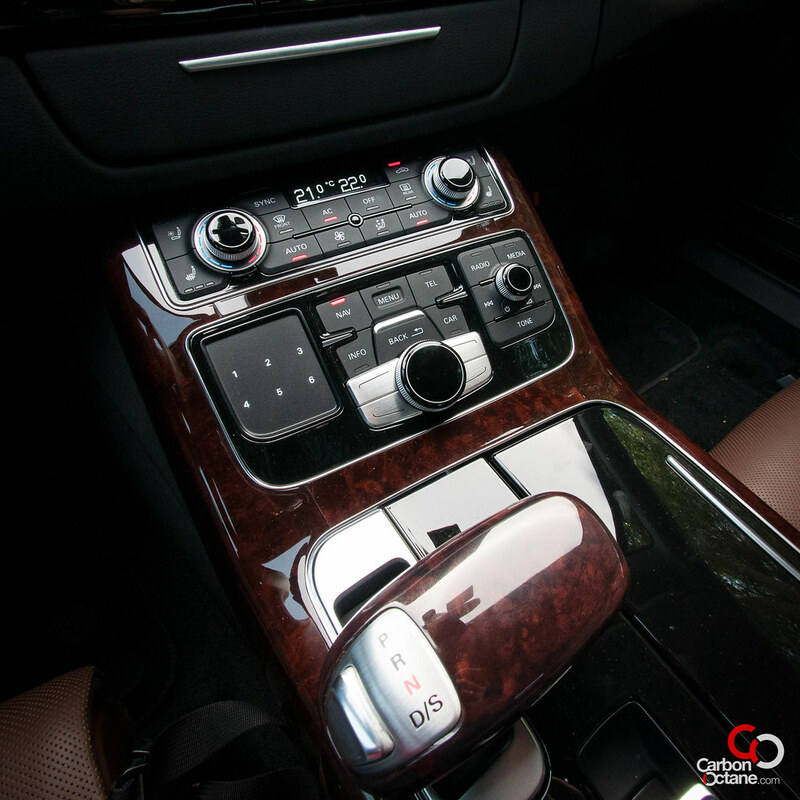 Add in premium touches like Ambient Lighting, electric blinds for the rear windows, MMI navigation system, four zone air conditioning, Multifunction leather steering wheel, rearview camera, wooden gear knob etc. 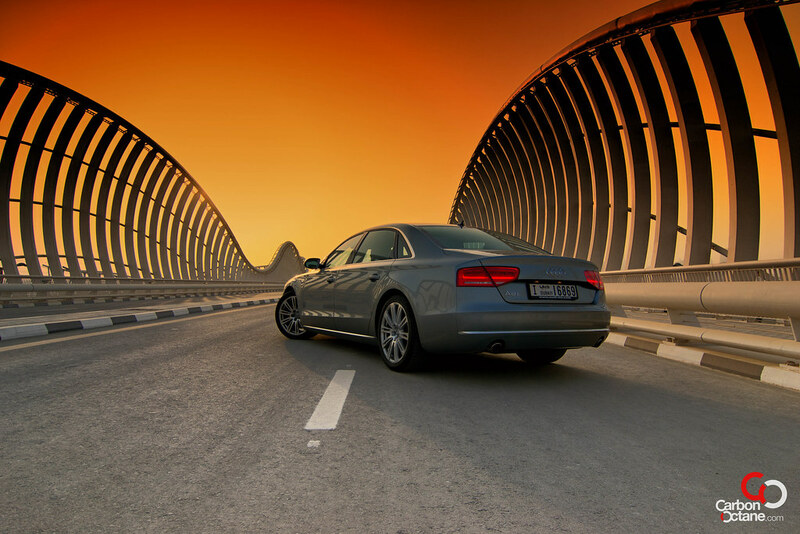 and you begin to understand Audi’s asking price of AED 308,000. The Style package which includes panoramic sunroof and the Rear Package Plus option add in Rear Seat Entertainment, TV reception, Bose Surround sound, individually adjustable rear seat, power assisted door closing and ventilated seats affront and rear while bumping up the asking price to AED 366,000. As the saying goes: In for a penny, in for a pound – because it’s well worth the extra outlay if you are in the market for this type of sedan. If all this sounds like we’re overwhelmed with the passenger experience, we are – and it is as Audi intends. 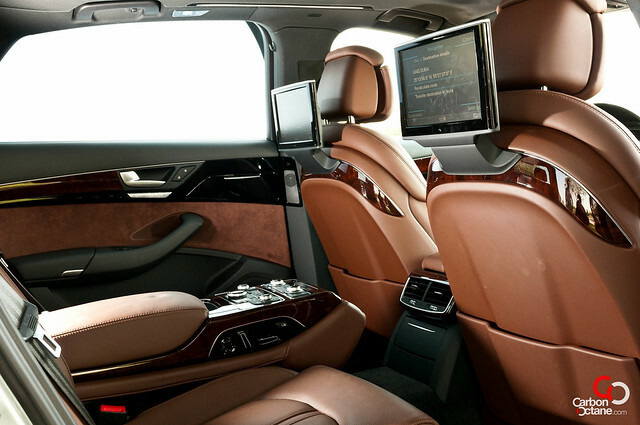 This is a car that allows you the choice of either indulging yourself in the driver’s seat or employing a chauffeur while you indulge yourself in first class comfort. Even if you did get a chauffeur to run errands, you could rest assured that the passenger seat experience would be serene and relaxed. Unless of course, you’ve signed up the Transporter himself as your chauffeur!